I’ve had CommentLuv Premium on a trial run for the last several months. It definitely had an impact on the number and type of comments I received on my blog. It’s also caused me a lot of work, which I wasn’t expecting. I’ve decided to remove it and in this post I’ll tell you why, along with tips for how to. And, I’ll give the skinny on the new Google Plus Comments plugin that everyone is talking about and why you don’t want to install it yet, the hurdles it will have to overcome, and why it promises to be a game changer like no other. I’ve heard so many great things about CommentLuv from people that I respect that I finally decided to install it myself. Those folks include top bloggers like Kristi Hines, Ileane Smith, and Ana Hoffman. I made my comments DoFollow and even gave folks the option to include a link to their Twitter profile. Once I saw the interface, I ran straight to Christine Cobbs helpful video to get it set up properly. I wanted to know what I was doing and why, and she, and her guest, Regina Smola, did a wonderful job of delivering that info. Within a couple of weeks I was seeing a sustained ramp up of comments on my blog. Unfortunately, a lot of them were either straight out spam, or looked spammy. Worse, I honestly couldn’t tell if some of them were spam or not. Yes, I had more comments, but I also suddenly had a lot of new moderation work on my hands. The spam filter was catching them, but I actually had to read through them and spend time deciding if it was real or just someone trying to get their quota so their links would show. I also started receiving more comments simply because of the content I was putting out and the new friends I had made over on G+. There was no doubt they were real people who left interesting comments and contributed greatly to the conversation. with or without the CommentLuv sugar. With all of the constant tweaks Google makes to its algorithms, I became concerned about leaking Google juice via all those comment links. And I started being concerned about broken links over time. And I started being concerned about a sudden drop in PR. I searched for other opinions all over the Internet and found there were just as many people for using CommentLuv as against, and all had valid reasoning, and data to back up what they were saying. In other words, I was more informed than when I started that search, but no closer to understanding whether the outbound links were a good or bad thing. My site must have gotten listed on one of those DoFollow posts and the spam went through the roof. That alone was enough to make me want to remove CommentLuv. So I did. And no telling how long it will take for my site to come off that horrid list of spammers just looking for easy links. 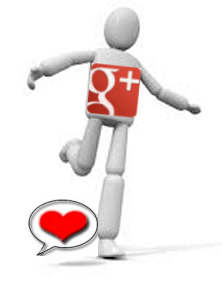 A few weeks ago, Google released G+ Comments for Blogger. It took less than a week for a developer to hack the code and make a plugin for WordPress. More developers are working on it too, and some have even hard coded it into their site. But, there are some major issues with it. For starters, you’ll never be notified when someone leaves a comment. Second, there is no spam filter. So, you’d have to check all of your posts all of the time to moderate. That’s a no-can-do for most everyone. There are plenty of other serious implications too. Here’s one of the original discussions on it and here’s another. There’s even a G+ Comments Community for it. Keep in mind that Google made the original code for Blogger, which is another of its products. WordPress has an entirely different commenting system. So, it will be a while before the developers work out all of the bugs and caveats. One of the main hurdles I hope the developers can overcome is exclusivity. There will have to be some kind of login, just as there is now for regular WordPress comments, but it shouldn’t be exclusive to have to sign into G+ first. And, it should play well with the native comment system. The other hurdle is that you don’t give up control over the content and can back up your comments along with your site. Both are big hurdles, especially the last one. With the way it will cross-pollenate the conversation between your site and G+, and beyond, it will be a game changer. An official, fully functional version of a G+ Comment plugin is on the way. And like all plugins, there will likely be several from different developers, all with various functionality (and bugs). So, it’s not if, it’s when. And now that CommentLuv is off my site, I’m ready. Before you make any major change to your site, do a full backup and download the .zip file! Because CommentLuv integrates into the database, I was concerned about what it would take to entirely remove it. I was delightfully surprised to discover that it’s as easy as deactivating and deleting the plugin. I did check my database and there is no residual left of the links. There is very little info on the Internet for removing it, and only a couple of old posts that tell you how to scrub your database using MySQL queries. I was prepared to do that, but happy I didn’t have to. I also reinstalled G.A.S.P., which is a super companion to Akismet, and is made by the same developer as CommentLuv, Andy Bailey. CommentLuv worked as advertised, and may be a super plugin for some, including folks I respect. It’s just not for me. I’m testing hack versions of the new G+ Comments code on a sandbox site. And, I’m keeping close watch on the conversations about it. I’ll be sure to keep you posted. And if you want to ensure that you see those posts, do two things. First, Circle me on G+. Second, subscribe to my blog posts. That way you’ll be sure to stay in the know. I wholeheartedly agree, MaAnna. I used to have it installed years ago but it was a lot of work then too. Nice to see you dug deep and found it didn’t delete previous comments!!! I dug as deep as I felt comfortable with for the time I had. Via mySQL, I couldn’t actually see the end of the comment on some, which is where the link would be. I could see it on a few, and they didn’t have links, so assumed the rest got removed too. Appreciate Andy making it so the plugin bows out gracefully. I know I don’t like poking around in the database, and can’t advise that clients do. Too much to mess up too easily. I am sorry for the bad Commentluv experience. Commentluv is really a great add on but for establish blogs like yours with tons of traffic, I think a basic WordPress comment form will do! I will still recommend it for new websites and blogs looking for traffic and comments. I look at it sort of like having AdWords on the site. It works better for some than for others. CommentLuv it a good plugin, but was just not a good fit for me. Yeah, Commentluv definitely increases interaction on pages, and services dropmylink, easily lets spammers find out commentluv enabled blogs to throw their links on such sites. But, originally in my terms Commentluv is amazing when it comes to expose your content on any popular blog, If you had written an amazing post, and the post title flashes well in the comments, it surely grabs a lot of eveballs and brings noticeable amount of traffic. I’ve recently disabled CL at Traffic Generation Café, MaAnna, simply because of the access broken links. Even though Andy Bailey has since then built a plugin to take care of it, I still haven’t gone back. I am in the process of adding G+ comments as well, just to see how well it does. Ana, yours was one of the sites I included in my general statement about folks I respect who use the plugin. Appreciate you telling us why you have disabled it, especially since it’s a different issue than I’m having. I hear the new plugin Andy created is working well for broken links. Please do be very careful with G+ Comments. It’s not quite ready for prime time yet and still has major issues with spam holes because you don’t get proper notification when a comment is left, and you can’t check every post on your site constantly. I’ve still got it on a sandbox site for testing, and it looks very promising. I’m positive several developers are working on a good solution for WP sites and they’ll be releasing them as soon as they get all the issues addressed and bugs worked out.